For questions about giving to IPIL, or about the instructions below, please contact the IPIL Program Director at (713) 743-2180 (or email to ipil@uh.edu). IPIL is grateful to all of its Sponsors and Supporters. Sponsors typically are organizations or firms. Supporters are individuals. All Supporters are recognized on the list of IPIL Sponsors and Supporters on the web. Supporters who give $1,000 or more also are recognized, along with Sponsors, on the next cycle of IPIL’s print marketing. 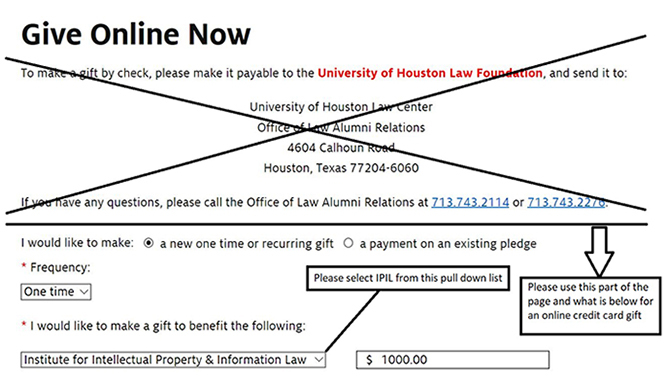 To make a gift by check, please make it payable to the University of Houston Law Foundation. Write IPIL in the memo of the check. 2. Once you are on that page, scroll down to the Gift form.